I had heard some pretty great things about the Evergreen Pumpkin Run 10 Miler last year. I am fairly certain that the only reason I didn’t put it on my race calendar is due to some kind of scheduling conflict. I do, however, remember it being freezing cold that day and being pretty glad we skipped it. Because I’m a total sissy. 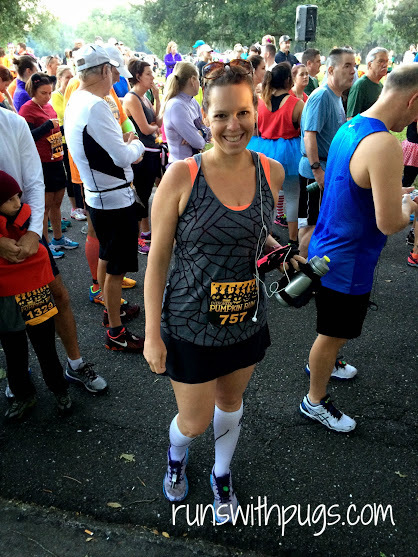 However, when one is in the throes of marathon training, it’s hard to turn down longer races when they could so easily convert to training miles. And since Mr PugRunner and I were going to be staying in the area to go to the Dolphins game, it only seemed right to give this race a try. We had a decent night’s sleep and got ready pretty quickly. The hotel restaurant was open, and they were kind enough to package up a couple of bagels and coffee for us to take in the car for our ride to the historic Evergreen Cemetery. That’s right. We would be running through an actual cemetery. It wasn’t bad ride and we were able to get great parking, right between the start line and the staging area. The temperature was in the low 50s, maybe high 40s, and that was kind of rough to take in. I knew that once I started running, I would warm up, but it would have been nice to have on a few extra layers. We picked up our timing chips and I went to the restroom, and then we got back in the car to sit in the heat for a little bit, before meeting up with our friends. As we were chatting, I realized I had to go to the bathroom again, but by this time the lines were LONG! Ugh. I wish I could have skipped it, but there was no way I would last ten miles, so I just maintained patience. I got done pretty much just in time to hightail it over to the start. Whew. On this day, I figured I would try out my compression socks to see if they would give my calves any kind of additional relief. Cramps have been an issue for me, and I am testing out my options. I was also testing out a new handheld water battle, one with a larger capacity for extra Gatorade. The morning was gorgeous: clear and crisp. I was definitely grateful for that. After the National Anthem, we were off. It was a phenomenal race. For a the first 3.1 miles, the 10 Miler runners and the 5K runners stayed together, winding a loop through the cemetery. It was a little crowded, and I found myself having to pull off into the grass on the side of the path for my walking intervals to avoid interrupting the flow of traffic. Things eased up dramatically after the 5K group peeled off for their finish. We criss crossed through the cemetery, over train tracks and around structures. There were some out and backs and turnarounds, but it was interesting and scenic and fast. Boy, was it fast. There were some inclines and rough pavement, but nothing too challenging – in fact, for me, the worst part was a very narrow roadway that seemed to be on the side of the cemetery. It ran next to some trees and another path and was in the full-on sun. Even though it was cold, beating sun can be draining, and I was glad to get back under cover for the last few miles. I spotted Mr PugRunner a few times along the course. We had agreed not to run together because our intervals didn’t match up, but it was nice to see him out there. At one point, it looked like he was struggling and I asked him if he wanted me to run with him, but he said he was ok and told me to go ahead. The last couple of miles got a little annoying. There were still some great volunteers at the water stations, but a lot of the runners who had already completed the course were wandering back in to pick up pumpkins from along the path (in addition to your medal, you get an actual pumpkin!). While most of them were extremely considerate of the people still running, a few seemed to have no problem blocking portions of the running path and getting in the way of those still out there. It kind of messed up my groove a little, but I kept going. Finally, the path turned into the staging area. I had been playing leapfrog with another woman, pretty much the whole race, and we finally drew up next to each other. While looking for the finish line (it seemed like it was hidden! ), we joked about how we had been pacing each other and how our GPS watches were reporting 10 miles and we were done whether we found the finish or not. One more turn and it was in our sights. A quick peek at my watch showed me that I was on track to beat my 10 mile time and I found a last little bit of energy. My new buddy turned it on, too, with a bit of a laugh and I called out to her “This is my PR!” as we sprinted over the final mat, neck in neck. I know, in my heart, that all races would be PRs. However, it has been pretty discouraging, if not demoralizing, to be spending so much time training and racing and not see any kind of progress. Sure, I had a couple of instaPRs in there from distances I had never run before, but nothing that I could say that I really earned. Beating my Tower of Terror time by several minutes was such an incredibly huge boost. I snagged some water and waited for Mr PugRunner to finish. He had rolled his ankle early on and that had held him up, but this race marked his longest-ever distance! He is so ready for his first half in just a few weeks! I am so proud of him. It took a few minutes to stretch out the kinks, and we were ravenously hungry, but nothing that a hot shower and a good meal couldn’t fix. The compression socks had worked great, I really liked the water bottle, and while I was a little bummed that I hadn’t worn something a little more Halloween-y (there were tons of people in costumes), I was thrilled to be floating on my runner’s high. The volunteers were amazing, offering lots of encouragement and support at the well space water/Gatorade tables and the course was one of my favorites. I hope to be back next year. Another great race for us! I’m so happy we went ahead with it! 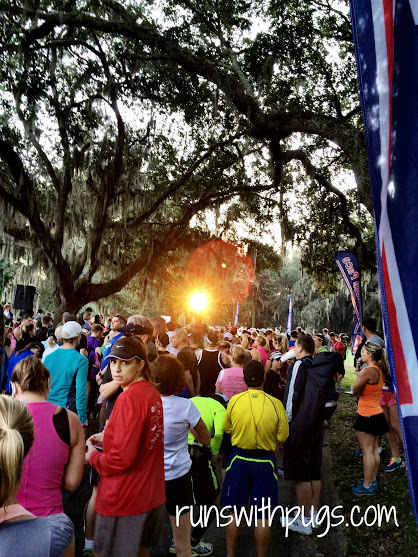 Do you have a little local race that you just love running? What is it? What was a recent running accomplishment that put you on Cloud 9? So nice to see you! 🙂 Halloween is so fun. I wish there were more races around that time of year! Congrats on your PR. I wish my hubby would run. I am on Cloud 9 whenever I PR. There are quite a few local races that I love. Thank you! I was so happy! I do love having my husband run and having that shared interest between us. It can get tricky when we have conflicts of scheduling or childcare, but we work it out. Woohoo! Nice job on the PR! And that’s a great medal! I mean it’s no Pugicorn, but it’s a pretty close second. And look at you relaxing a little about it being a race and trying out the socks and water bottle! Such a good plan to use it as a training run. I bet it was pretty neat (yet mildly creepy) running through a cemetery. We don’t have many distance races that are themed like this. Mostly it’s 5K’s around here. 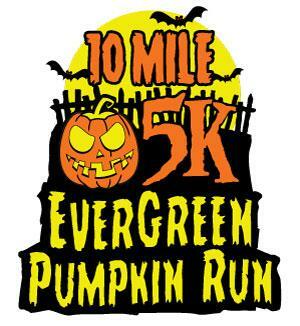 I do the 5K Pumpkin Run every year held the next town over from me. It’s really tiny, about 100 runners or so. 1 mile of it is on a trail which is super challenging since I don’t normally do that. But it’s a ton of fun, and I love wearing a costume for it! Also love that spiderweb tank you have on! Well, no. Nothing will come close to touching that Pugicorn LOL! I figured that the only way to figure out if something was going to work was to put it into action. And my legs felt great! Ok, maybe not great, but definitely not awful. So that’s something. And I really think I made the right choice in bottle. It’s a little more bulky than my other one, but I love that I have more fluid and can fit more stuff into the pouch. I would really love to try something on a trail. I’m a little scared, but one day, it will happen. And you know what I love? That tank is not spiderwebs. At all. But, I picked it because I didn’t have a costume and I figured that it looked close enough to be spiderwebs in case anyone asked, LOL! It’s awesome that you picked up on that! Congratulations! I will have to put that race on my calendar next year. I wanted to run it this year, but the scheduling didn’t work. I definitely recommend it. It was unique, fun and just a little off the norm. I hope your schedule lines up next year! Oh my goodness congratulations on your new PR!!!!! I’m sorry Mr. pugrunner rolled his ankle I hope it heals up quickly for his half! That’s so crazy that some of the people you do it already finished or blocking part of the course that’s totally inappropriate. I’m jealous that you were able to run a 10 mile race I have never run one before and for some reason it just sounds like it would be the perfect distance to race. 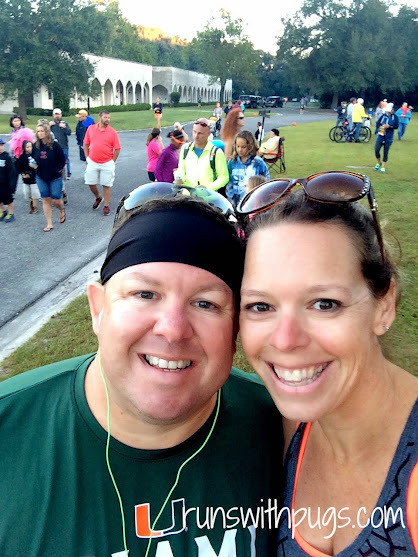 Anne recently posted…Southern Fried Half Marathon Recap -New PR! I was a little irritated by the select few. I was glad that they were able to run their race, but one would hope that they realized that other people were out there, trying to reach their goals, too. Not cool. 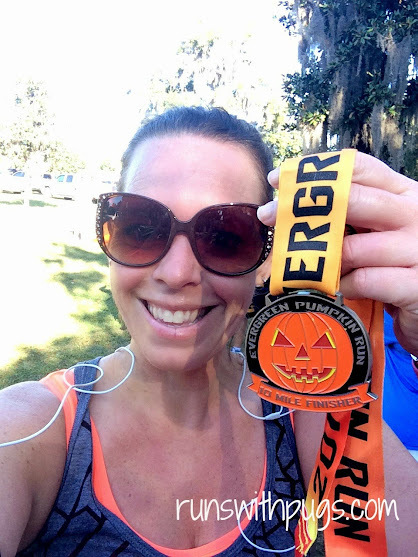 This is actually my second 10 miler (Tower of Terror in 2013 being my first). It’s a really nice distance. I hope you can come across one near you so you can give it a try! I’m still bummed I missed this one — it is one of my favorites! Yay for a PR and the longest run ever for your husband! Exciting!